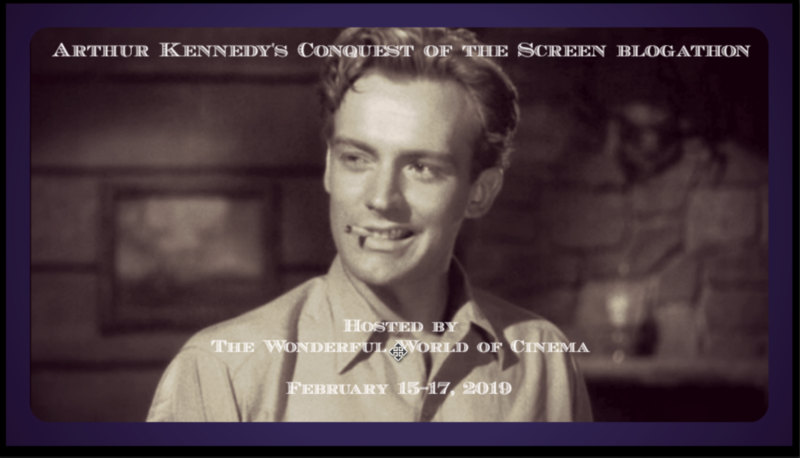 This is the first of two posts dedicated to The Arthur Kennedy’s Conquest of the Screen Blogathon which will be taking place over at Wonderful World of Cinema next month on the 15-17 February. Brief Synopsis – A bomber crew on their way to be redeployed in the Pacific have their lives turned upside down on the day of the attack on Pearl Harbor on Dec 7th, 1941. My Take on it – This is a film that I knew nothing about when I chose to review it or this blogathon besides the fact that Arthur Kennedy was in it. 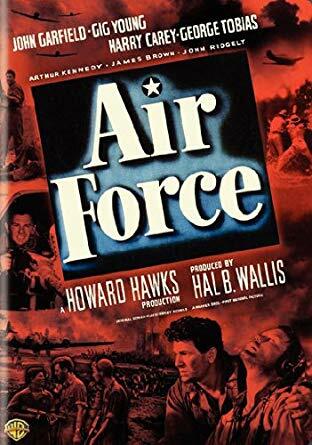 I was quite surprised by how much I enjoyed this film and they do an amazing job showing such a patriotic depiction of the crew of this bomber and all of the other characters in this story. We get to see how the outbreak of war affects each of these men and how the paths of their lives changed following that fateful day on Dec 7th, 1941. Love the way that this film doesn’t even attempt to make any of the characters the lead and this truly is an ensemble cast that shows the diversity of the military both in personalities and opinions. This helps form the camaraderie of the crew as they all are on equal footing throughout and no one is specifically spotlighted. The bonds tat these men form come across quite realistically and we can believe them as both crew-mates and as friend and comrades in arms. The cast is great with John Garfield, Arthur Kennedy, Harry Carey and Gig Young all doing superb jobs in their roles. There have been lots of other films that have tried to copy many of the elements of this film and most don’t manage to do it as effectively or successfully as they do here. It is true that this film was used as propaganda during the war to boost moral but even after 76 years, it still comes across with such a great patriotic feeling towards everything. The fact that this film was made during the middle of World War II when no one truly knew what would eventually happen since there seemed to be no end in sight makes the Patriotic feeling ring so true since in hindsight, it adds such a deeper and poignant layer to the way the story is told. Bottom Line – Such a great and patriotic depiction of this crew as they see their whole lives changed before their very own eyes. The cast is great and this is truly an ensemble film where none of the characters take the lead. That actually helps show the camaraderie of the crew over the course of their ordeals and we get to see how they bind so well by everything happening. Garfield, Young, Carey and Kennedy are all superb in these roles. Many other films copied many of the elements of this film less successfully than they do here. This film might have been used as propaganda but even after 76 years, it’s still able to seem patriotic in all that occurs. This rings even truer when one considers the fact that when this film was made, World War II was still raging with no end in sight which adds an even deeper and poignant layer to it all. Highly Recommended! Thank you! I’ll add this to the roster when the blogathon starts. If you could just submit the link again in the comments of the new post I’ll publish when the blogathon starts, that would be great! This way I won’t forget it! Wow! I want to see that now! As a matter of fact, I think I borrowed it once at the library but never had the time to watch it. Oh wait, I AM at the library now. ;)) I really enjoyed your thoughts on the film. You don’t reveal any spoilers and are very convincing on why this film is worth seeing. I particularly like the idea that there aren’t any “lead”. I probably won’t be touch by the patriotism as much as you are but I surely feel I would enjoy this film. Thanks for the great review! You can never go wrong with a Howard Hawks film. It is nice to see Kennedy and such a fine ensemble, plus a meaty role for actor John Ridgely. Timely in its day and emotional today. I can’t remember how many times I’ve seen this movie–it wears very well. It’s really interesting seeing an earlier B-17, too.